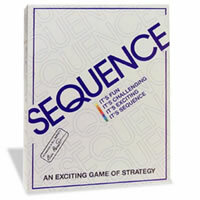 Sequence is a great combination of games that will have surely become a favorite for you and your family. Your goal in the game of Sequence is to get 5 chips in a row on the game board. Sequence can be played individually or as teams. Either way, Sequence is a great choice for the entire family and will have you plotting to figure out the best method to outsmart your opponents. Make sure you have a backup plan just in case your opponent tries to trip you up. Sequence is a great family game that is quick-moving and enjoyable for everyone. Be sure to check out Sequence for an easy-to-learn, fun game. Play Sequence today. For 2 players or 2 teams: One player or team must score two Sequence before their opponents. Sequence will have a game board, 50 green marker chips, 35 red marker chips, 50 blue marker chips, 104 sequence cards and the official Sequence board game rules and instructions. Please keep in mind that the official Sequence board game rules and instructions could be different depending on the game version you have. The rules below are some of the exact directions on how to play Sequence. Share with us your comments, funny stories, tips, advice, strategies, creative ways to play, questions about how to play, problems with the rules or anything you want about Sequence. All submissions will be reviewed within 24 hours. Click here to add your Sequence comments. If a person has aligned with 5 vertical and add 4 more is that another sequence? Can two sequences be made by crossing a vertical and diaphanous line? If you overlook a sequence can you claim it next turn? If you have all dead cards plus a wild jack in your hand, do you have to play the jack before drawing a replacement for a dead card? If you have a sequence in the middle of the board and then you fill in from both ends.Would that count as two Sequence? Can you play a 2 eyed jack as a one eye jack? Anyone ever get an answer to "What happens when the board is full but no one has one or two sequences (depending on player count)?" What happens when the board is full but no one has two sequences? If someone makes a sequence of 8, for instance they have 3 on one side and 4 on the other and they put their middle chip in, does that mean they have to decide right there and then which five chips they chose as their sequence? If both players have a sequence and the first player gets a second sequence, does the second player get to lay a card since player 1 got an extra turn? If so and they both get their second sequence, what happens? We have a playing board where Kings are in the center. What are the rules for that version? We are wondering if you can combine the last chip in a vertical sequence with four more in a straight line to make a second... Essentially using nine pieces in a line??? Rules don't really mention this. Question, my father in law tried to play a two eyed jack as a one eyed jack saying that if it’s wild he can turn it into any card he wants. We didn’t allow the move but could he have done that? So I got 7 in a row. Does that count as 1 point or 3 points? Dead cards- I have a pair of x's and only one place on the board avaible. Is it fair to say that I have a one dead card to be replaced? Re comment from Peter on October 6th. I respectfully disagree with your interpretation. The emphasis might just as well be on the 'any' as on the 'one'. I think that if whoever wrote the rules wanted to limit the use of only one space from your first Sequence as part of your second they would have written the word 'only' instead of the word 'all'. Just following the rules. Rules question: If 2 players fill the entire board and neither has 2 sequences (particularly if 1 player has 1 sequence, while the other player has none) is the game considered a DRAW? I could not find the answer in the official rules included with the game. The Sequence game rules state that "you may use any one of the spaces from your first SEQUENCE as part of your second". I take this to mean that I can add a single chip to the end or beginning of an existing SEQUENCE to create a new SEQUENCE. Just following the rules. Dolly, the rules say "You cannot remove a marker chip that is already part of a completed SEQUENCE". You can't remove their sequence. A player turns in a dead card and pulls a replacement card that's also a dead card can the player pull another dead card. Is the Nordic version different from the, presumably, American version generally available? The reason I ask is that I learnt to play this game in Norway earlier this year, and I think the board layout may be slightly different. I loved it and want to buy a game for my sister, who also participated in the Norwegian games. What was the answer to cheryl's question? If your opponent accidently removes one of there chips with the one eye jack? If the opponent has a sequence and I got one eye Jack. I removed their sequence. Does that still count as their sequence ? Or all 5 chips must be presented at all times to have two sequences? You may talk over the table. In the rules we are finding different ways of interpreting the play when one plays a one eyed jack. The rules quote "Once a Jack is played, it ends the turn.". Some of our players insist this means you don't pick up so from that point on you are one card short, others say that that the game continues in the usual fashion with the player picking up a new card from the kitty after playing the one eyed jack. What is the answer to Jim's question -- "does a player have to announce that they have a sequence. If it was not claimed by the team with the sequence can the other team remove the chip with a wild card?" If someone puts a wild card with 2 eyes and sets it on the place he was going to originally, but then quickly changes their mind and moves it somewhere else, does it count? Is that allowed? If you have a Sequence in the middle of the Game Mat, and then you fill in both ends (two or more chips) so that your chips extend all the way across (10 chips), can you claim that as a second Sequence? does a player have to announce that they have a sequence. If it was not claimed by the team with the sequence can the other team remove the chip with a wild card? Is there any way to play with 5 people? Could there be a one man team playing for both and if not why? If at the bottom of the board, there are six chips of the same color in a row. How many are considered the "sequence," and can you add one to one new chip at one end of the sequence and two at the other end, can that be considered two sequences? If a player does not notice that they have a double sequence with one chip during their play. And notice it after their opponents plays. Do you still consider it a double sequence or did they get two separate sequences? If a player uses the one eyed jack but accidentally removes their own chip. Is that considered a good play or do they continue playing and have the chance to remove their opponents chip? Can you use more than one chip from an existing Sequence to create a second Sequence? When playing with 4 people and one person alerts the other of a sequence they didn't see do they get to claim the sequence or is this considered table talk? I want to give the game as a gift to a family in Germany who do not speak English. Are there instructions in German? If you already have a sequence, can you use one of the already used crown up chips to create another sequence? If you have four on the left and four on the right horizontally with a space between, if you put a chip in the center, do you have two sequences??? If a sequence is formed by selecting a play that is between two,three,or four cards creating a sequence longer than five cards...can either cards on the end of the sequence available to be removed by playing a one-eyed jack? Or are all cards considered a part of the sequence thus ineligible to be removed? when one player turns in a dead card and the replacement is also a dead card, can the player continue getting more cards? A sequence of 5 is played including a free space. Same team plays another card extending the sequence to 6. Can 2 of the squares out of the six be used to create another sequence? When playing Sequence with 4 people, if one person alerts his partner that there is a Sequence that neither of them saw, can they claim that Sequence? I would think that would be considered "table talk" and would not be admitted as another Sequence. if you have a sequence in the middle of the outside edge of board,and then fill the rest of the outside spaces. Do you have two sequences? after a sequence is made using the free corner space, can opposing players use the same free space to make their sequence during that game? A player turns in a dead card and pulls a replacement card that's also a dead card, can that player pull another card again? Why are there less red chips than green and blue ones?